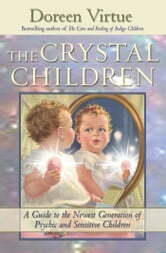 Crystal Children reflect the new generation that has come to the Earth plane after the Indigo Children. They are approximately ages 0 through 5, although some members of the first wave of Crystal Children are as old as 7. These children are like Indigos—highly psychic and sensitive—but without the dark edge and the anger energy. The term Crystal Children is already taking hold worldwide, and people everywhere are talking about these special kids. Since Doreen is the only researcher who is publicly giving speeches on the subject, her audiences have been asking her for a book on the topic. It’s a natural sequel to her book The Care and Feeding of Indigo Children. As babies, Crystal Children may take longer than normal to begin talking. They are highly telepathic, and their tuned-in mothers communicate with them nonverbally. Because they’re so sensitive, the Crystal Children babies may fuss and cry a lot in crowded places. They’re also very fond of nature. Doreen once watched one Crystal Child walk from tree to tree, giving each one a big hug. Crystal Children are beautiful inside and out, like magnificent little high-priests and priestesses. One look in their eyes, and you’ll recognize Divine love and wisdom. Their auras are bright, radiant, and opalescent—they seem to glow from the inside! They talk about past lives, distant galaxies, and profound insights concerning peace and love. Most Crystal Children’s parents are aware that their kids are special, and they’re thrilled to be parenting such delightful children. The book includes many interviews with Crystal Children, their parents, and teachers. It discusses parenting and teaching methods that are essential to keeping these children happy and healthy, and how to avoid pitfalls that could spoil their special gifts.